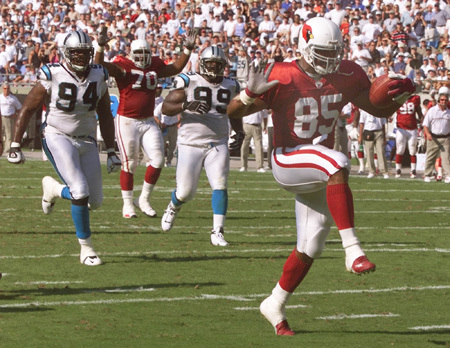 In 2002, the Cardinals signed tight end Freddie Jones as a free agent. He had a good start to his NFL career while in San Diego, and he was an upgrade at the position. Turns out he was necessary that season too, because starting receivers Frank Sanders and David Boston each suffered injuries (as did MarTay Jenkins and Bryan Gilmore, the No. 3 and 4 guys) and with green wideouts like Jason McAddley and Nate Poole forced to play, a tight end was incredibly important. So, for the one and only time since the Cardinals moved to Arizona, a tight end – Jones – was the team’s leading pass catcher in a season. Jones had 44 receptions for 358 yards and one touchdown that season. Jones was even better the next season, with 55 receptions for 517 yards (that was Anquan Boldin’s rookie year, though, with 101 catches). And in 2004, Jones had 45 receptions for 426 yards. By 2005, though, Jones was gone. And the Cards have been searching for a tight end since. As of now, that hope rests with third-round pick Rob Housler out of Florida Atlantic, a speedy 6-foot-5 H-back type who should be able to stretch the field. His blocking needs work, something he admitted already, but it would help to have a quality receiving option in that spot. Since Jones left, it’s been a lot about hope unfulfilled. The undrafted tandem of Eric Edwards and Troy Bienemann was the first attempt. Then Leonard Pope was drafted, and while he flashed a couple of times, it was clear after 2007 and coach Ken Whisenhunt’s first season he wouldn’t be the answer. Ben Patrick – whose contract is expiring — also flashed a few times as a seventh-rounder (especially with his TD catch in the Super Bowl) but he never has made a huge impact and never had more than 15 catches in a season. Granted, in the Warner years, using three- and four-wideouts made more sense, especially when the wideouts had the talent that the Cardinals did. Whisenhunt made clear Housler could be split wide at times and create mismatches, however. And, as many fans have pointed out, when you are breaking in a younger quarterback, the safety valve of a quality tight end can help with the learning curve. Housler will get a chance to show what he has, and there is a chance the Cards also look in free agency. Jim Dray should be back, and Stephen Spach could be too; Patrick may be more iffy depending on who else is signed. The Cards will have at least four tight ends in training camp. We’ll see if any of them can, at the very least, echo Freddie Jones. A great question. I do not know. Keep Housler — watch his film, the guy is good. Get John Skelton’s brother what a tentem. His a tight end that on the free agent market. You can’t go wrong. Is Todd Heap available? I know he has a young stud named Dennis Pitta behind him at TE in Baltimore.I also would echo ZACH MILLER!!!!!!!!! I don’t see how Housler could be considered a TE/H back if he has difficulty in blocking. IMO, he’s a big WR that could be thrown in the spread packages. The Cards haven’t had a true franchise TE in their history. Jay Novacek was close, but he was more like Housler and his success came mostly in Dallas. Chris Gedney was a possibility, but ownership turned that into a bloody mess. As far as Faneca being able to talk to teammates, I originally thought that if he’s filed his retirement papers, yes, but Favre signed his after the Jets and still inked with the Vikings the next season, so I’m unsure of the legalities in this strangest of off seasons. great stuff in the john lott piece. it really seems like the players are missing out right now. LETS GET WARNER FOR OUR QB COACH!! ARE YOU WITH ME CARDINAL FANS????? some of you guys must not watch football. john skeltons brother isw a joke…we need a veteran at tightend and should have never got rid of boldin. Has Spach or Dray been to any of the Fitz workouts by chance? Interested to see if either of them have been involved with the “unorganized” team activities thus far? Thanks! I haven’t been to those workouts so I don’t know. What is everyone talking about? Spach dropped like ONE pass that was thrown to him last season and it was a terrible throw by one of the several mediocre QB’s that the Cardinals had on the field in one season. The dude blocks like a beast, works hard, and 99% of the time catches the ball if it is not thrown WAY overhead (multiple times last season) or directly to the defender (at least once last season). Goodness people. It seems to be working fine on our end. Zach Miller, Bo Scaife, or Kevin Boss in that order. Let’s go cards, we need a franchise type TE for real. We need a guy the defense is scared of and threatened by. K. Rhodes mentioned on nfl dot com that his biggest concern was not having the time to learn the new plays and schemes. To your knowledge do the players ever organize study sessions among themselves? That’s tough to do without coaches. For instance, they will be trying to learn a new defense of Ray Horton. But without Horton, it’s tough. The other defensive coaches are going through that learning right now. Really, I’m pretty certain that if our top 4 receivers get injured, any one of our TEs will have 40-50 catches. And, with Whiz’s unwillingness to run the ball, I’m sure some washed-up QB will be throwing at least 50 times a game. So there should be plenty of receptions to go around. I think Kevin Boss would provide the Cardinals with a big body and a force in the middle of the field. They should definitely pursue him. Please don’t say “the Cards have never had a true franchis tight end in their history”. Maybe in AZ, but a guy by the name of Jackie Smith was was known as one of the best ever. J V Cain was good to, but past away suddenly and prematurally. Sure hope Housler works out. My apologizes. Don’t know how I passed over Smith in my thinking. Isn’t Jackie Smith in the HOF? Didn’t see your reply to joe67 until after I posted my comment…And for the most part you are correct, the TE postion has not given this organization a lot of production through the years. I’ve been saying that for weeks Cards should look at Zach Miller…He will be a free agent when lockout ends…He has led the Raiders in Receptions since his arrival in Oakland. Bring him home!!! another novacek would be more than we could hope for. if he learns to block he may be our best 3rd round pick since wilson. Thank you but not necessary. Probably before your time. He was always one of my all time favorites. Watched him carry three Eagles (one on his back and two draped around him) from the ten yard line to score a touchdown. Just happened to be in that corner of the end zone. I will never forget it. I so much wanted to start the Kyle Rudolph Fan Club for us, but since that dream ended with the draft I hope we pick up Zack Miller out of Oakland.He has done a very good job and been a professional during tough times in Oakland. I like Mercedes Lewis, Jacksonville talent, but do not know much about him as a person or teammate. Anyone have knowledge of Lewis?